Taking care of ourselves includes taking care of our nails. Afterall, it is one of the first things that people notice. It can say a lot about a person. And so it is not surprising that we (me included) schedule visits to nail salons for some needed professional nail care and pampering. I am still hopeful that I'll find my go-to nail salon. Is it Get Polished!? Read on to find out. There's a recently opened branch in Sun Mall Residences along Espana Avenue, Manila. I was there last June 2014 (I know, this review is way overdue!) and tried their Totally Polished Spa Mani/Pedi package. The service includes cleaning, spa, paraffin treatment, and polish. Clean and not over-crowded. I am not very particular about interiors when it comes to nail salons. I am easily satisfied with it being tidy, organized, and a space that can accommodate clients comfortably without the seats too close to one another. I appreciate those that don't force to entertain 10 people if the area can only accommodate half. Get Polished! in Sun Mall Residences is relatively smaller compared to other nail salons I've been to. 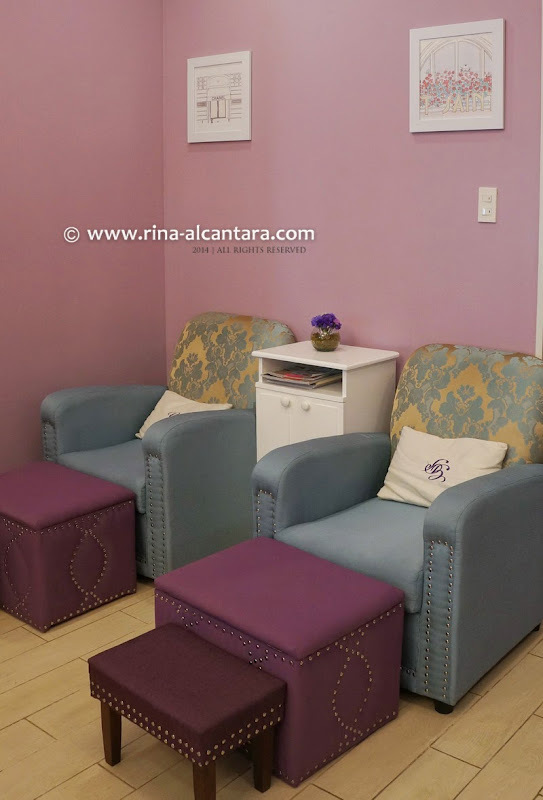 But it still manages to design comfortable seating arrangements and for nail technicians to easily move around the salon. Sterilized nail implements. This is definitely a big deal for me. One can never underestimate hygiene. With so many clients a salon accepts daily, it is imperative that they should disinfect nail tools. Get Polished! has a sterilizer located at their polish rack and it is not just for display. I saw my nail technician pull out a freshly sterilized set of tools, bring it to my station, and opened it in front of me. Thumbs up to that! A good selection of nail lacquers. I am hard to impress when it comes to nail polish selections on nail salons. Probably because I always compare it to my stash at home. But I still feel that the polish rack should be impressive. I would rather be a client having a hard time deciding on a color rather than be a client with limited choices. Get Polished! have a good collection of polishes to choose from, but I wish they had more. More variety of colors please! And I wish they could design their polish wall more creatively and carry more brands. There are a lot of underrated nail lacquers available in the market that would make a good addition to their rack. The place is well-lighted. 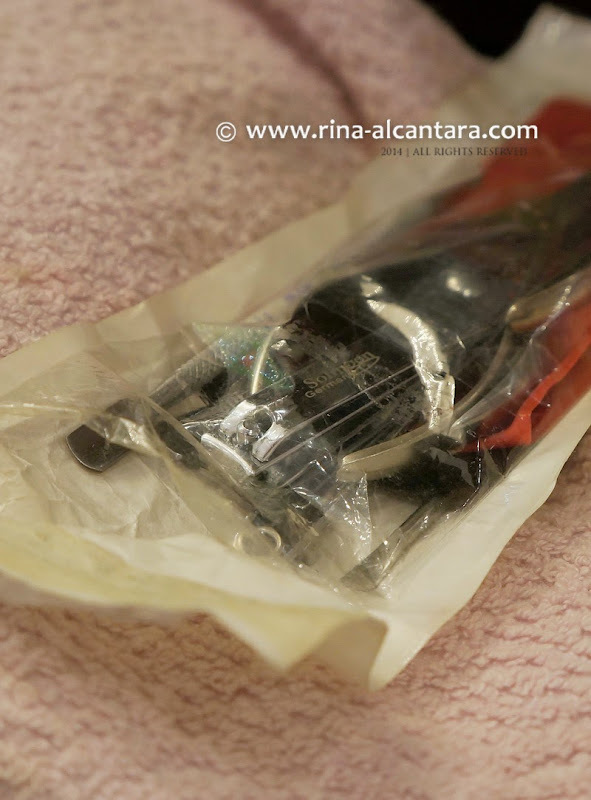 How can nail technicians do their work well without proper lighting? Yes to lights and no to cuts! Treatments are not rushed. This is also very important to me. How many times have you gone to a nail salon for some pampering and not get pampered at all because the nail technician is in a hurry to finish your service to accommodate another client? Well, this happened to me a lot of time. This is one of my deal breakers. I want to get my money's worth. Thank you, Get Polished! for taking the time to finish my choice of service. Sterilized nail instruments sterilized before my service began. The nail polish rack found beside the reception counter. More are placed on other shelves. Improper nail filing. After one nail, I immediately asked my manicurist to stop filing my nails and just proceed with the cleaning. It's either done in one direction or not at all. I can let it pass on my toenails, but never on my hands. For one thing, it is difficult to shape a nail if you file on both directions. Polish application was satisfactory. I expected more. Nail polish should never touch the cuticle area. Mine did. Aside from it being part of proper nail care, the manicure will look uneven when the nail grows out. (See photo below for reference) I have yet to encounter a nail technician who can polish my nails and meet my expectations. No cuticle oil in the end of treatment. Friction is bad for the nails/cuticles. A manicure or pedicure should always end with application of cuticle oil to moisturize the cuticles. The oil can actually prevent smudging or ruining your fresh manicure. No nail prepping before polishing. With all the chemicals used to during the clean up process, nails should be rid of oils or cleaned before applying nail polish. Most of the time, alcohol is used. This is an essential step that most nail salons I've been to does not do. Prepping the nail before polish application will promote longer lasting manicures and there are a lot of clients who has retired from regular visits to nail salons because their polishes easily chips or doesn't last. Application is key even if a polish promises long-lasting wear. Products used are not properly labeled. I am a curious customer. I like to ask what is being used on any part of my body. Although the tools and other "stuff" used are organized in a portable rack, they look too generic especially without proper identification. I needed to ask my nail technician during my foot spa treatment what she was doing, what is it she was putting on my legs, etc. I would have appreciated being talked through the procedure since I was a first-time customer. Sort of like what happens during a massage. The therapist will inform you what she/he is doing. It would also make clients feel more special (so to speak) to see lotions, base coats, alcohol, and other nail care products on good-looking refillable bottles. My manicure. Neat with minor blobs on the cuticle area. 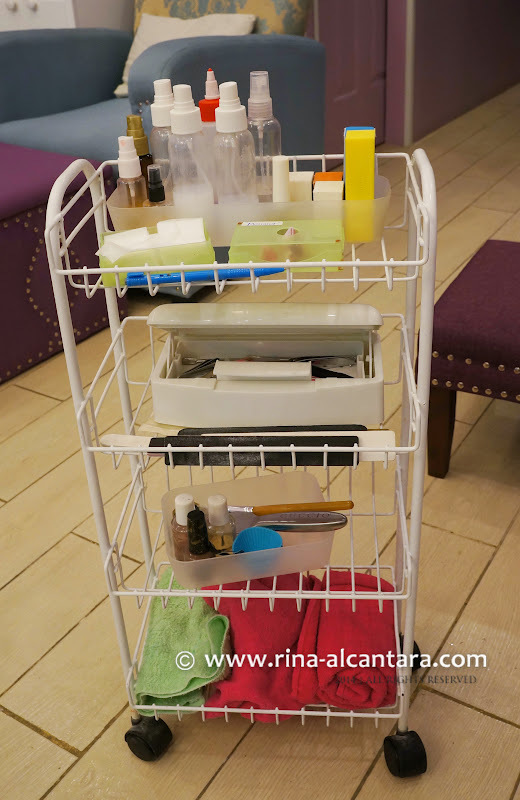 Organized nail care equipment on a portable rack that still has room for improvement. Disclosure: This is an invitational review with free trial of their service. It did not in any way affected this impartial review. Full disclosure policy can be read here. I had a complaint posted on their FB and followed it up through Messenger and they blocked me. This complaint is at their Robinson's Las Pinas branch. They cut my nails too short and made it bluntly square which did not suit my fingertips. They also have poor customer service, they do not like answering product/service related questions and it's as if it's pain for them to entertain questions. This happened just today (March 19, 2016). I am sorry that you had to experience this and thank you for sharing with us your story.